On a new pair of trousers I made recently – to wear at the Golden Shears – I introduced a little design element I saw on a pair of customer’s trousers. It’s an extended crossover with eyelet and buckle. So the tab that you normally button down onto the waistband is extended, run under the first belt loop and then fastened with a buckle into an eyelet on the tab. You can see it on a different pair of trousers above. 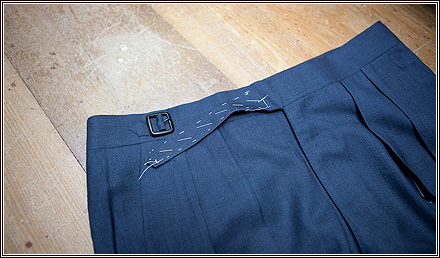 The customer had it with more than one eyelet, so it could be used as a means of adjusting the waist of the trousers. But I opted for one. I have a fixed waist so I don’t need the adjustability – it’s decorative rather than functional. My standard of making on the trousers is improving rapidly as well (these pairs that are for me I make myself) in such a way to obtain the cleanest possible finish. My general sewing is getting better – inserting the lining, for instance. Or getting the right amount of tension when you’re machining the side seams. You need a little bit of tension on the top side when you’re connecting the two edges of the side pockets, so there is enough strength there and the pocket doesn’t become misshapen after they’ve been worn. That goes for the hip pockets too: you need a certain amount of tension in the hip pockets, so they don’t sag when they’ve been worn in. Also when you’re tacking the side pockets down, you have to be careful to overlap where the seam and the facing meet. These are all points that I’m improving with each pair I make. Next I’m looking at making some navy moleskins, western style with cross pockets, to try that. My technical perception and sewing ability is becoming much more refined.